Clarksville, TN – Unlock the secrets of the soul! Just in time for Halloween, Robert Louis Stevenson’s chilling portrayal of man’s dual nature comes to life upon the Roxy Regional Theatre stage in “Dr. 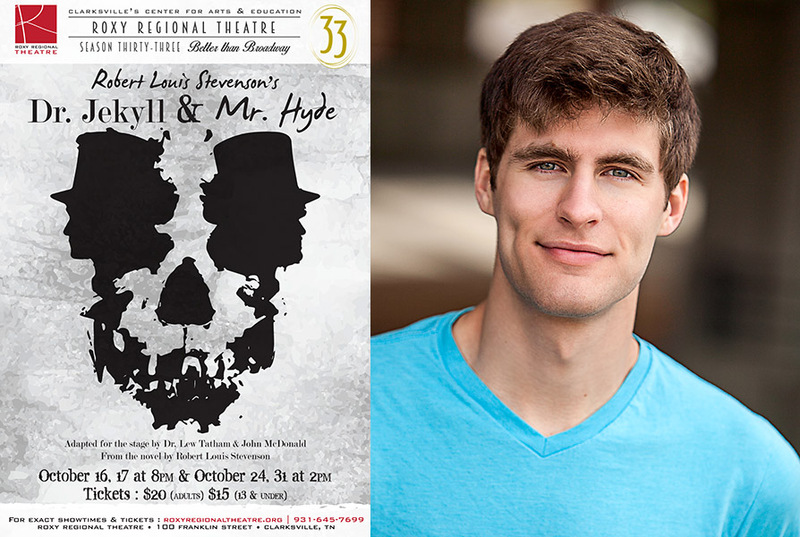 Jekyll and Mr. Hyde”, beginning a limited run on Friday, October 16th, at 8:00pm. Idealistic young scientist Dr. Henry Jekyll creates a mixture he hopes will eliminate human evil. In doing so, however, he unleashes the dark forces within, creating the hideous and murderous Mr. Hyde. Roxy Regional Theatres production of “Dr. Jekyll and Mr. Hyde” stars Jonathan Whitney. Adapted for the stage by Dr. Lew Tatham and John McDonald and directed by John McDonald, “Dr. Jekyll and Mr. Hyde” stars Jonathan Whitney in the title role, supported by Kelley Barker, Leslie Greene, James Hansen, Timothy Houston, Sean Michael Jaenicke and Matthew Smolko. Performances are at 8:00pm on October 16th and October 17th and at 2:00pm October 24th and October 31st. Friday, October 16th, is the traditional pay-what-you-can preview of “Dr. Jekyll and Mr. Hyde”. All tickets not pre-sold at the regular ticket price will go on sale at 7:30pm that evening for whatever amount patrons wish to pay ($5.00 minimum). This production is made possible in part through the generous support of Dr. Ernest & Joan DeWald, Dr. Gary & Janet Mund, J.T. & Diane Smith, and Dr. John & Cathy Stanton.